Cheesy potatoes, bacon, butter, and more cheese… what more could you ask for? These “smashed” potatoes are so decadent, you won’t be able to stop at just one scoop! Rinse and pat dry potatoes and cut into quarters. Place in a large stockpot with about 1 tsp salt and add enough water so that potatoes are covered by about 1 inch. Bring potatoes to a boil and cook for 15 minutes or until potatoes are soft. Set bacon aside to drain on a paper towel. Add butter, milk, mozzarella cheese, sour cream, and parmesan cheese. Stir in reserved bacon fat (see? I told you there was a good reason to save that good stuff). Add a bit more salt in and fresh pepper, to taste. Stir in minced garlic and parsley, reserving a bit of parsley for topping later! Crumble bacon and stir in about 3/4 of it, leaving the remainder for topping. Preheat oven to 350 degrees. Coat a 9×13″ casserole dish with cooking spray and spread potatoes evenly. 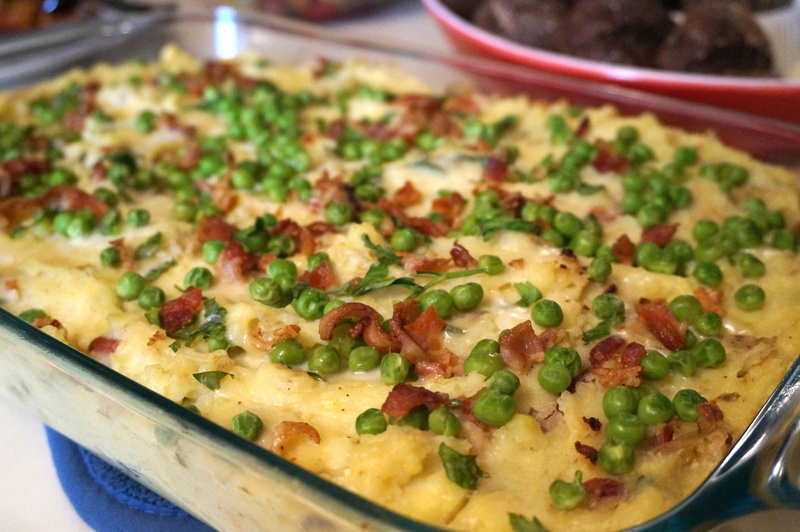 Top with peas, remaining bacon bits, and remaining parsley. Cover with foil and cook at 350 for 20 minutes, then 5 minutes without foil. i LOVE peas and i think they belong anywhere you can reasonably sneak them, and sometimes even other places too. 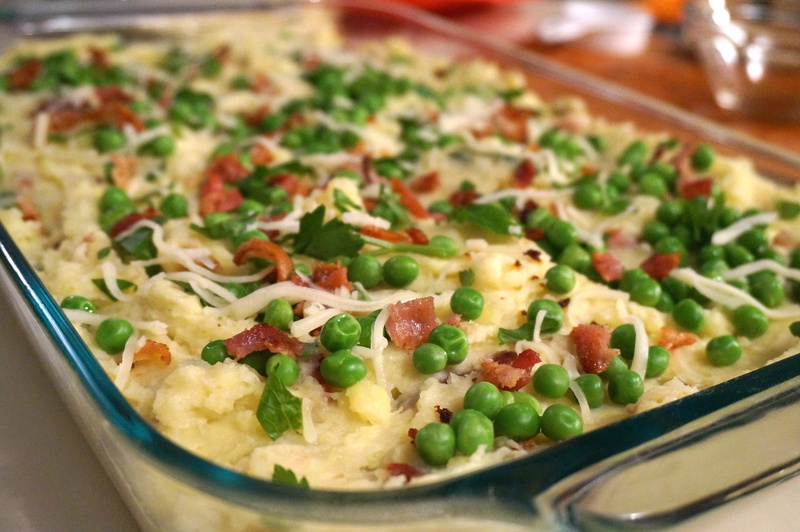 i’ve never added them to my mashed potatoes but it’s a great idea!